PEOPLE WORKING IN the Irish education sector are particularly at risk of developing work-related depression, a new study has found. 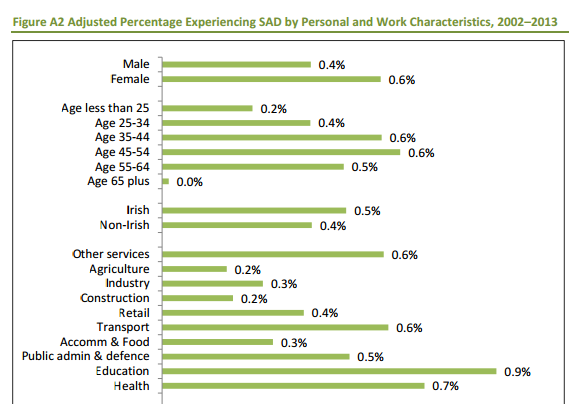 According to the report from think-tank the ESRI, in Ireland the risk of SAD illness is highest for workers in the education sector. In 2013, an estimated 55,000 workers in Ireland suffered from a work-related illness, resulting in the loss of 790,000 days of work, with SAD being the most common cause. SAD is work-related stress, anxiety and depression and accounts for half of all work-related illnesses. The report identified the risk factors associated with SAD and work-related musculoskeletal disorders (MSD), an umbrella term for ailments affecting parts of the body used for movement. The study also found that there is a greater risk of SAD illness for those working longer hours. People working over 50 hours are three times more likely to experience SAD than those working fewer than 30 hours. The ESRI said that the high proportion of SAD cases among work-related illnesses “suggests that a greater awareness of mental health issues is required”. “Employers find it difficult to assess and manage mental health risks, therefore further information and supports, such as stress-audit tools may prove useful,” it said. “There is a necessity to monitor work-related illnesses in sectors with greater risks of SAD and MSD and in organisations which operate shift work and night work. The research also noted that older workers are most at risk of MSD, and added that it is “important to consider measures that minimise the risks of MSD and assist those experiencing such illnesses”. ESRI associate research professor Helen Russell, who wrote the report, said the research findings “point to a need for targeted measures to address work-related illnesses”. “(This is) not only to assist workers experiencing difficulties, but also to tackle the issues of lost productivity, and the associated costs for health care and social protection,” she said. Email “Ireland's educators have the highest rates of work-related depression”. Feedback on “Ireland's educators have the highest rates of work-related depression”.